Senior chosen as the college and amateur golfer of the year. 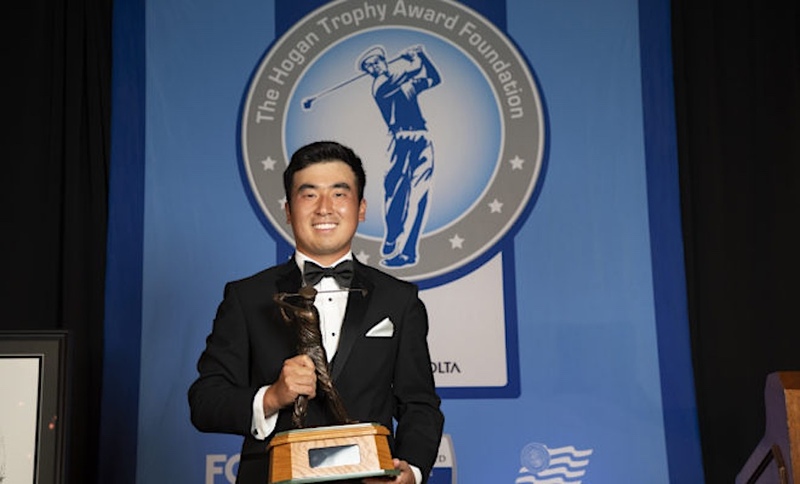 FORT WORTH, Texas (May 21, 2018) – At a black-tie dinner at Colonial Country Club, Texas senior Doug Ghim was named the winner of the 2018 Ben Hogan Award presented by Konica Minolta Business Solutions U.S.A., Inc. (Konica Minolta). The Hogan Trophy Award Foundation, Friends of Golf (FOG) and Golf Coaches Association of America (GCAA) made the joint presentation. Ghim is the No. 1 player in the Scratch Players World Amateur Ranking, and is listed among the top eight in the other three major ranking systems. He stands third in the World Amateur Golf Ranking, sixth in the Golfweek/Sagarin Ranking and eighth in the Golfstat College Ranking. Last month, Ghim earned the Silver Cup as low amateur at the 2018 Masters Tournament after finishing 50th. He was the only amateur to make the cut. In college play, the All-Big 12 selection owned a 69.54 college scoring average over 28 rounds in 2017-18. He picked up three wins, claiming medalist honors at the Golf Club of Georgia Collegiate before winning his final two events, the NCAA Raleigh Regional and Big 12 Conference Championship. In all, Ghim had six top-10 finishes this season and placed in the top 20 in eight of nine college events. Exactly half of his rounds were in the 60s, while 18 were under-par scores. The Ben Hogan Award is given annually to the top men’s college golfer taking into account all collegiate and amateur competitions over the past 12 months. The selection committee is made up of two dozen leaders and experts in amateur, college and professional golf. In order to determine the winner, each committee member cast a ballot that ranked the group of three finalists, which included Ghim, California junior Collin Morikawa and Ole Miss junior Braden Thornberry. The Ben Hogan Trophy was first issued by FOG in 1990 at Bel-Air Country Club in Los Angeles and also included academic achievement in its original list of standards. In 2002, the Ben Hogan Award moved to Colonial Country Club in Fort Worth, Texas, Hogan’s hometown and the site of five of his PGA TOUR victories. At that time, it revised its criteria to its current standard of honoring the outstanding amateur and collegiate golfer. In 2005, the tradition of inviting the three finalists began. Ghim is the first winner from the University of Texas since the award moved to Colonial and is the third Longhorn finalist in the last seven years, joining Jordan Spieth (2012) and Beau Hossler (2016). In 1997, Jeff Fahrenbruch won the Ben Hogan Trophy at Bel-Air. Ghim is the first Big 12 Conference recipient since Oklahoma State’s Peter Uihlein in 2011. Ghim was presented the bronze trophy from 2017 Ben Hogan Award winner Maverick McNealy and the crystal trophy from Eddie Merrins of FOG. In addition, Ghim also received the first exemption into the PGA TOUR’s 2019 Fort Worth Invitational. Since 2002, the Hogan Trophy Award Foundation has awarded more than $700,000 in scholarships to over two dozen schools. This year, $92,000 in grants are being distributed, with $32,000 going to the winner’s university, $16,000 to the two finalists’ schools and $4,000 to the seven semifinalists’ universities. Winners of the Ben Hogan Award include seven golfers currently ranked in the top 100 in the Official World Golf Rankings (OWGR)—No. 4 Jon Rahm (2015, 2016), No. 6 Rickie Fowler (2008), No. 34 Patrick Cantlay (2012), No. 48 Kyle Stanley (2009), No. 57 Peter Uihlein (2011), No. 66 Ryan Moore (2005) and No. 84 Bill Haas (2004). Other recipients include: Ricky Barnes (2003), Matt Every (2006), Chris Kirk (2007), Hunter Mahan (2003), McNealy (2017), Patrick Rodgers (2014), Nick Taylor (2010), D.J. Trahan (2002) and Chris Williams (2013). Since the committee began inviting all three finalists to Colonial Country Club in 2005, notable finalists include six players currently inside the top 100 in the OWGR—No. 3 Spieth (2012), No. 54 Russell Henley (2010), No. 82 Hossler (2016), No. 87 Jorge Campillo (2009), No. 91 Ollie Schniederjans (2014) and No. 92 Jamie Lovemark (2008).